Use this unit only in the manner intended by the manufacturer. If you have any questions, contact the manufacturer. Before servicing or cleaning unit, switch power off at service panel and lock service panel to prevent power from being switched on accidentally. When the service disconnecting means cannot be locked, securely fasten a prominent warning device, such as a tag to the service panel. Suncourt® Inc. does not provide electrical connection information. For your safety and protection follow all instructions and adhere to applicable building and/or electrical codes. WARNING - Unit should be installed by a qualified electrician in accordance with the National Electrical Code and other local codes which may apply. Failure to follow these instructions may result in electrical shock, fire hazard, or death. To reduce these risks, this control is to be used only with fans marked as suitable for use with solid state speed controls. This control is suitable for mounting in an approved metal or polymeric field enclosure. These controls must not be used at ratings exceeding those clearly marked on the device. If unit is installed in a bathroom or kitchen, power must be supplied from a ground fault circuit interruptor (GFCI). SAFETY WARNINGS - PLEASE READ CAREFULLY - This product should be installed and serviced by a qualified technician, electrician or electrical maintenance personnel familiar with its operation and the hazards involved. Proper installation, which includes wiring, mounting in proper enclosure, fusing or other overcurrent protection and grounding, can reduce the chance of electrical shocks, fires or explosion in this product or products used with this product, such as electric motors, switches, coils, solenoids and/or relays. This product is constructed of materials (plastics, metals, carbon, silicon, etc.) which may be a potential hazard. Proper shielding, grounding and filtering of this product can reduce the emission of radio frequency interference (RFI) which may adversely affect sensitive electronic equipment. If information is required on this product, contact our factory. It is the responsibility of the equipment manufacturer and individual installer to supply this safety warning to the ultimate user of this product. a) Motor type - shaded pole, P.S.C, and universal. b) Required load - fans, blowers and speed dependent loads. 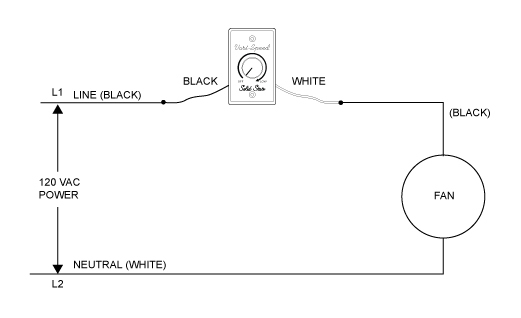 in series with motor and line voltage; never connect control across line. Connect black lead from control to black lead of incoming 120 VAC power. Connect white lead from control to black lead of fan. Ground - Be sure fan is electrically grounded. REASONABLE AIRFLOW MUST BE MAINTAINED TO PROVIDE SUFFICIENT COOLING OF THE MOTOR. WHEN USING WITH SUNCOURT® CENTRAX® CENTRIFUGAL FANS, THIS CAN BE ACHIEVED BY ENSURING THAT THE MINIMUM SPEED ADJUSTMENT IS NOT LESS THAN 1200 RPM. This control was designed to operate on motors used in diverse applications. A minimum speed adjustment is provided to allow independent control of the minimum speed setting. Minimum speed adjustment ensures motor runs with sufficient torque to prevent stalling. a) Motor must be in actual operating position to achieve proper speed adjustment. Motor will not slow down unless proper load is applied. b) Turn main control knob to lowest speed position. c) Locate and adjust minimum speed setting on the side of control with screw driver (rotate clockwise to increase minimum speed; counter-clockwise to decrease minimum speed). Note: On low speed you may experience a slight motor hum. If level is unacceptable, the speed setting may be altered to reduce the hum. d) Motor will now operate from this preset minimum speed to full speed. a) Install front dial plate (remove protective plastic on face of dial plate). b) Turn main control until switch clicks off. c) Push on knob so that pointer is in off position. 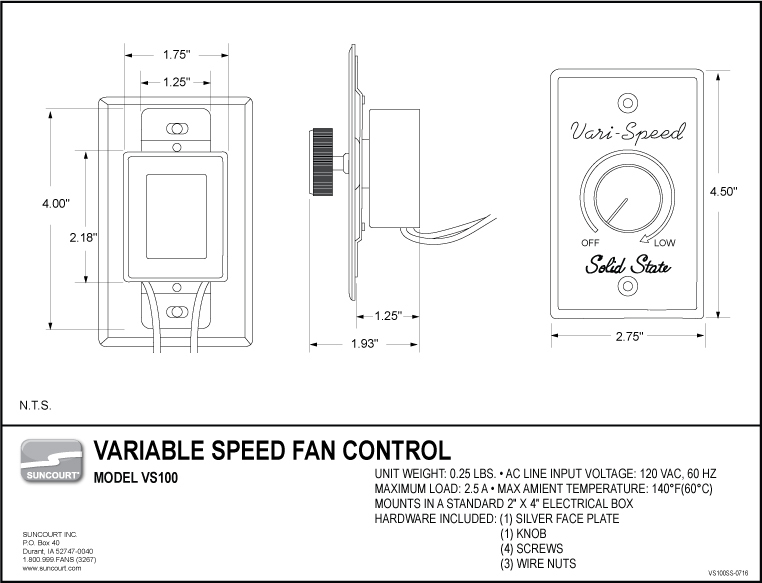 Subject to the following limitations, Suncourt® Inc. warrants that the Variable Speed Fan Control will, for 1 (one) year from date of original purchase, remain free from appearance of defects in workmanship or materials, when installed in accordance with all applicable codes and standards in the application for its designed and specified use. This warranty is subject to the following limitations: (a) manufacturer’s liability is limited to the replacement or repair of the unit, as decided by the manufacturer; (b) a defective unit must be returned, prepaid, with proof of purchase, to Suncourt; and (c) this warranty does not apply to defects resulting from the alteration, abuse, accidental damage, unauthorized repair, or misuse of the unit. This warranty is given in lieu of all other warranties, guarantees, and conditions on manufacturer’s part, and the manufacturer shall have no tortious or other liability in respect to this Variable Speed Fan Control.